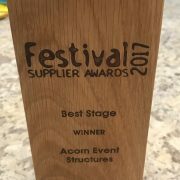 In a remarkable achievement, Acorn scooped its third consecutive award for BEST STAGE at the recent Festival Supplier Awards. The BEST STAGE award recognises Acorn as the top stage supplier in the UK for its unique products and services, which enable organisations to deliver world-class events. Commenting on the award, the FSA19 judges said “it is the finish and quality of the structures, plus attention to detail from pitch to delivery, that are unique qualities to Acorn making them a clear winner in this category”. Said MD Andy Nutter “Winning this award for the third year running confirms the continued strength of our team to develop and engineer unique temporary structures which meet challenging briefs and diverse production specifications. In an ever-evolving industry, we continue to invest in new products and we are dedicated to developing unique concepts to meet growing demand and push the boundaries of structural design.